A magnitude 5.7 earthquake has hit near Tokyo, shaking buildings in the Japanese capital. No tsunami risk is reported. 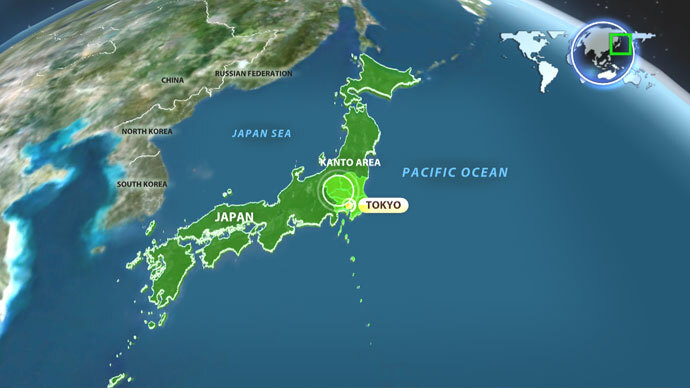 The US Geological Survey said the quake had hit at 16:23 local time (0723 GMT), with its epicentre 57 kilometres north-northeast of Maebashi and around 143 kilometres north-northwest of Tokyo. A few minutes later a 4.7-magnitude aftershock was registered, The Daily Yomiuri reports. "It shook vertically for about 10 seconds. Nothing fell from shelves and window glass was not shattered. There was no report of fire and we are preparing to patrol the city," Takayuki Fukuda, spokesman for the Nikko city fire department in Tochigi prefecture near epicenter told AFP. The Japan Meteorological Agency had earlier put the magnitude at 6.2. The agency said the epicenter was about 10km deep. It registered 5 in most parts of Tochigi, including Nikko, 4 in Fukushima and Gunma prefectures, 3 in Saitama and 2 in Chiba and Tokyo, where tall buildings swayed for upwards of half a minute after the quake. National broadcaster NHK said no abnormalities were detected at nuclear power plants near the epicenter.